From desert floor to mountain top, southern New Mexico is the Land of Enchantment, with a variety of climates and terrain to please almost all tastes. Outdoor recreation opportunities abound – we have more than a million acres of National Forest and public land available for horseback riding, snow skiing, hiking and biking, fishing and hunting, exploring and ballooning! Cultural attractions include arts, music, dance and theater productions at the Flickinger Center for Performing Arts, top name entertainers and casino gambling at the Inn of the Mountain Gods, wine tasting at excellent area vineyards, and visits to historic villages, art galleries, museums and archaeological sites. Tularosa - the "City of Roses" - is a small village of 3,000 residents set in the Tularosa Basin. It is the oldest town in the area. 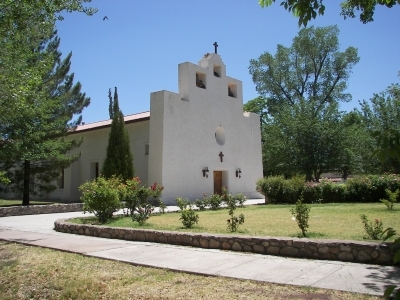 Tularosa is famed as a center for horse training and as a wine producer, and is well-known for its historic district and the church of St Francis de Paula. Alamogordo (means “fat cottonwood tree”) is the area’s main population center, with more than 30,000 residents. The town hosts the Otero County Courthouse, a regional airport, and a number of Federal government offices. Holloman Air Force Base, just six miles west, is home to the US Air Force 49th Wing, the 54th Fighter Group and the Luftwaffe (German Air Force) Flying Training Center. La Luz, founded in 1863, is a lush, tree-filled community neighboring Alamogordo. The mountain resort village of Cloudcroft provides services for and access to mountain lakes and streams, horse racing, golfing and skiing. New Mexico mountain communities such as High Rolls, Mountain Park, Bent, Weed, Mayhill, Sacramento, Timberon and Piñon are the gathering places for folks who want to enjoy life out of the mainstream and the sustainable lifestyle. There are excellent medical facilities throughout the area. Alamogordo has the Gerald Champion Regional Medical Center and a VA Clinic. Ruidoso is home to the Lincoln Country Medical Center. El Paso (Texas) has a full VA Hospital. Tularosa, Alamogordo and Cloudcroft also have urgent care clinics. Holloman Air Force Base has an on-site clinic and pharmacy, as well as a large Base Exchange. Outdoor recreation is a southern New Mexico specialty! Golfers enjoy The Lodge Golf Course in Cloudcroft and Desert Lakes Golf Course in Alamogordo. Hunters, we have more than a million acres of hunting land in the Lincoln National Forest and on White Sands Missile Range. Fishing is available at a number of area lakes. Hikers and horseback riders can access hundreds of miles of forest trails. 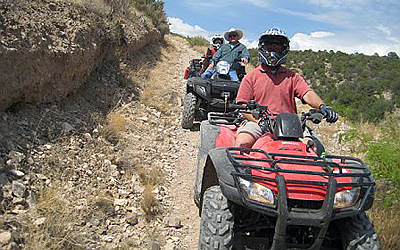 And there are many off-road trails for ATVs, motorcycles, quads and mountain bikes. Come and find out for yourself why southern New Mexico is a great place to FIND YOUR FREEDOM! United Country - Properties provides complete real estate and auction services throughout the entire Tularosa Basin and Sacramento Mountains area of southern New Mexico. We're here to serve all your real estate needs: residential, rural, recreational, farm, ranch, orchard, vineyard and commercial. If you’re looking for a home for sale, or a ranch for sale, make United Country – Properties your first choice for honest, ethical and professional real estate services.